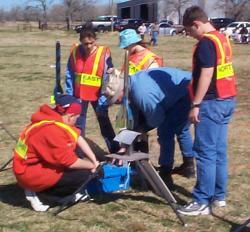 On Saturday, February 23, the Krueger Science and Advanced Technology Middle School (KSAT) held a rocket launch as part of their curriculum. Many students, family, and friends descended on Old Kingsbury Aerodrome to set up, launch, track, and gather data on various model rockets. The KSAT program is a magnet school in San Antonio which uses rocketry as a focal point for a science- and technology-based program of study. This provides a concrete point on which the students can focus, bringing the often-abstract study of science and mathematics to a tangible level that allows the students to see how the principles they are learning can be applied to the real world. Besides, model rockets are fun! Old Kingsbury Aerodrome provides an excellent location for a rocket meet. Its open grounds and lack of close neighbors means there is plenty of room for rockets to launch and land, while the pavilions with electrical power give a chance to provide food services to the hungry crowds (and when the crowd is mostly teenagers, hungry takes on a whole new meaning!) The food pavilion was coordinated by Ron Hozza, and his crew of NJROTC cadets from Seguin performed admirably serving out burgers, hot dogs, chili, and other culinary delights during the day. Thanks to all of you! For this event, the airport was closed, reducing the conflict that might otherwise occur between unmanned rockets and transient aircraft. This also allowed the runway to be used as a safety buffer, and also provided for placement of rocket tracking stations in a good position to track the launches. The launch coordinator mentioned that they were getting good data on every launch, which they had not been able to do at previous launch sites. Although the airport was closed, the doors were open on the aircraft hangars so that, between launches, the attendees could look at some of the PFM collection. The students brought a wide variety of rockets to launch. Two lines of launch stations were set up - one for medium-sized rockets using C-class motors, and one for larger rockets (scale V-2 rockets) using F-class motors. Most of the C-class flights were multi-stage, until the booster motors ran out. 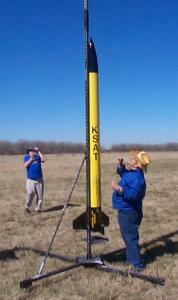 In addition, there was a high-power demo launch using the KSAT 'Big Yellow' rocket which has an M-class motor. With twelve launch stations (8 for the C-class, and 4 for the F-class), a full launch from the flight line took 30 to 40 minutes. 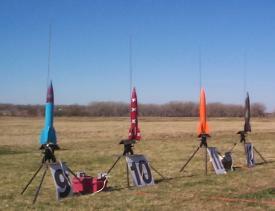 Since the day started early, and launching continued till about 5:00 PM, that's a lot of rockets! Here is the V-2 flightline, and on the left we see one of the V-2s launching. Once the entire line was launched, the flight-line crew went out with the rockets for the next heat and re-set the line. This involved setting up as many as twelve rockets as quickly as possible, including running the necessary checks on the launch pad to insure that it was ready for another launch. Once the line was set up, everybody was moved back behind the safety line, and the range control officer checked to make sure all of the teams (tracking one and two, range safety, etc.) were ready. Once everyone was ready, each rocket was announced along with the name of the student who had built it, a brief countdown was announced, and the rocket was launched. After the ejection charge fired, the tracking stations reported back their data so the flight could be evaluated. Then the next rocket would be launched and tracked, and this would continue until the flight line was empty. 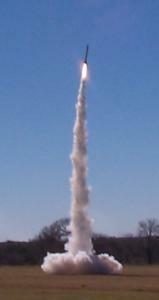 The highlight of the day was a noon demonstration launch of a high-powered model rocket. This is the KSAT 'Big Yellow', powered by an M-class engine developing 350 pounds of thrust. Big Yellow is a well-equipped rocket, with two on-board video cameras and transmitters (one looking to the side, one looking down the rocket's body), dual altimeters, dual GPS units, and backup timers for the recovery system. The information from the GPS units is transmitted along with the TV signals from the cameras to the ground tracking station, so as to make it easier to recover the rocket after the flight. This rocket can attain an altitude of over 7,000 feet, and it will drift as far downwind under its parachutes, so the GPS is essential to reduce the amount of searching needed to find the rocket after a flight. As with all high-power rocket launches, Big Yellow requires an FAA waiver and a notam warning of unmanned rocket flights in the area. A quick phone call to San Antonio approach control just before the launch insured that the airspace above us was clear. Once all of the heats had been run, the final event of the day was a simultaneous 'drag race' launch of a rocket from every available launch pad. After this spectacular finale, the weary but content crews packed up and headed for home. Come join us in May for the next launch day!